Prepare in the same manner as Fergana Pilaff. Add slices of quince and boil. 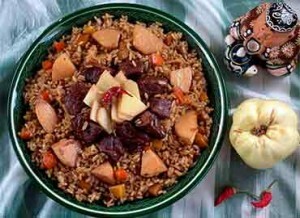 Before adding rice take out quinces and put them on the rice before covering. When pilaff is finished, mix rice and serve in a mound on a large platter topped with quince pieces.